Five metronomes tuned to the same frequency are started at different times. In a short time interval, all metronomes will become synchronized. The synchronization is caused by being able to vibrate on a surface that readily couples the metronomes. Directions for doing the demo: First, make sure the metronomes are all tuned to the same frequency of 176 hertz and that the windup keys have been removed from the metronomes. Place them on the board and start them oscillating at different times. 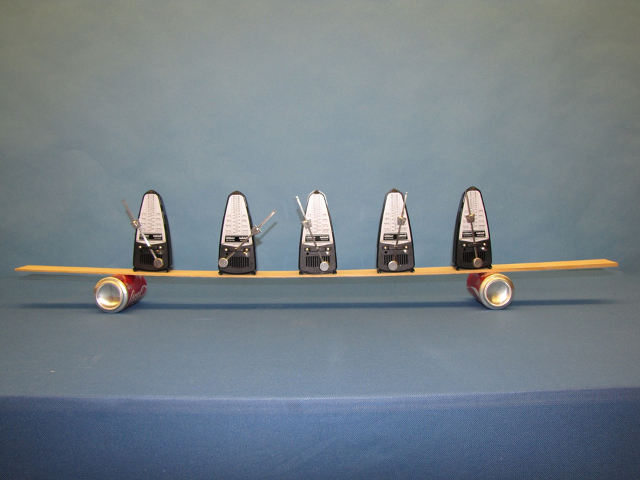 Pick up the board that holds the metronomes and place it on the cola cans. Wait for the metronomes to get in synch. Suggestions for Presentation: This is a dramatic demonstration of Resonance.